I really love these family photos generally taken in front of the wagon. Scottish Travellers is a loose term that covers many diverse peoples in Scotland and even beyond. Here, I’m primarily looking at the indigenous folk who seem to be descend from an in situ population of itinerant craftsmen and laborers. 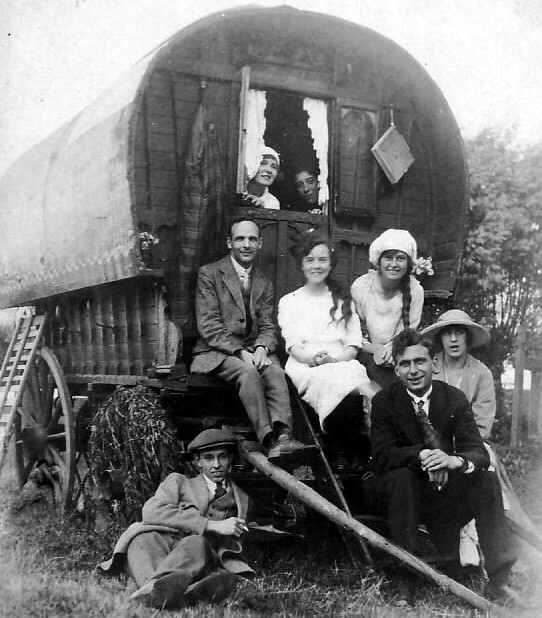 Scottish Travellers, or the people termed loosely Gypsies and Tinkers in Scotland, consist of a number of diverse, unrelated communities, with groups speaking a variety of different languages and holding to distinct customs, histories, and traditions. 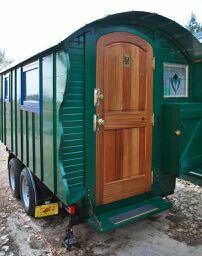 There are three distinct communities that identify themselves as Gypsies or Travellers in Scotland: Indigenous Highland Travellers; Funfair Travellers, or Showmen; Romanichals (a subgroup of the Romani people) and Lowland Gypsies. Indigenous Highland Travellers – In Scottish Gaelic they are known as the “Ceàrdannan” (the Craftsmen), or less controversially, “luchd siubhail” (people of travel) for travellers in general. Poetically known as the “Summer Walkers”, Highland Travellers are a distinct ethnic group and may be referred to as “traivellers”, “traivellin fowk'”, in Scots, “tinkers”, originating from the Gaelic “tinceard” or (tinsmith) or “Black Tinkers”. Mistakenly, the settled Scottish population may call all travelling and Romani groups tinkers, which is usually regarded as pejorative, and contemptuously as “tinks” or “tinkies”. Highland Travellers are closely tied to the native Highlands, and many traveller families carry clan names like Macfie, Stewart, MacDonald, Cameron, Williamson, and Macmillan. They follow a nomadic or settled lifestyle; passing from village to village and are more strongly identified with the native Gaelic speaking population. Continuing their nomadic life, they would pitch their bow-tents on rough ground on the edge of the village and earn money there as tinsmiths, hawkers, horse dealers or pearl–fishermen. Many found seasonal employment on farms, e.g. at the berry picking or during harvest. Since the 1950s, however, the majority of Highland Travellers have settled down into organized campsites or regular houses. The Highland Traveller community has a long history in Scotland going back, at least in record, to the 12th century as a form of employment and one of the first records of that name states a “James the Tinker” held land in the town of Perth from 1165-1214 and share a similar heritage, although are distinct from the Irish Travellers. As with their Irish counterparts, there are several theories regarding the origin of Scottish Highland travellers, one being they are descended from the Picts, excommunicated clergy, or exiles from the pre-Norman-Invasion. Highland travellers are distinct both culturally and linguistically from other Gypsy groups like the Romani, including the Romanichal, Lowland Scottish Travellers, Eastern European Romani, and Welsh Kale groups. Several other Continental European groups are related to the Scottish Highland Travellers, and share similarities to other non-Romany groups across Europe, namely the Yeniches, Woonwagenbewoners in Holland, and Landfahrer in Germany. As with Norwegian and Swedish Travellers, Highland travellers origins may be more complex and difficult to ascertain and left no written records of their own. As an indigenous group Highland Travellers have played an essential role in the preservation of traditional Gaelic culture. Travellers’ outstanding contribution to Highland life has been as custodians of an ancient and vital singing, storytelling and folklore tradition of great importance. It is estimated that only 2,000 Scottish travellers continue to lead their traditional lifestyle on the roads. We have a family of tinkers that visit the village every so often. We always buy a few things from them too. Hand crafted tools/ornaments. The wife and I will sit down with them and have a coffee over a small fire, catching up. Great little family, very kind and polite. Thanks for sharing. There are still some out there.